Designer Edward Chew has created a stunning series of Tetra Pak light fixtures that are made entirely from recycled cartons. 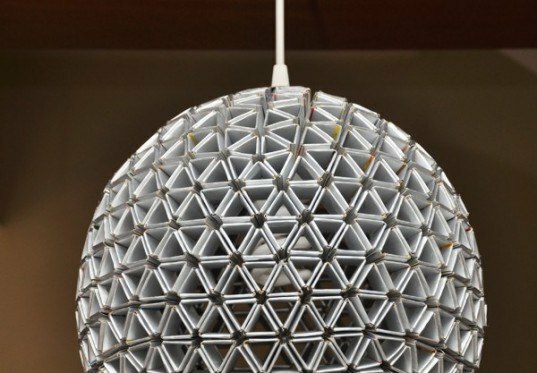 His intricate geometric designs are made by carefully cutting and folding strips of the material into triangular shapes, which are then assembled without the use of screws or glue. Chew's lamps cast a delicate net of shadows upon surrounding surfaces and are available in floor-based cylindrical pillars or suspended spheres of light. This brilliant design is the grand prize winner in our Bright Ideas Competition - if you're a fan of this stunning design, check it out along with the other amazing entries here. “Imagine if each of us were to turn the empty boxes after each quench into a hexagon, and collectively knot them together, what possibly could we achieve?” says Chew. The boxes were unfolded and then transformed into 108 hexagons by cutting 6 strips of 6 squares, each 130mm x 21mm, to form a triangle. The lamps are also available in a cyclindrical floor-based version. 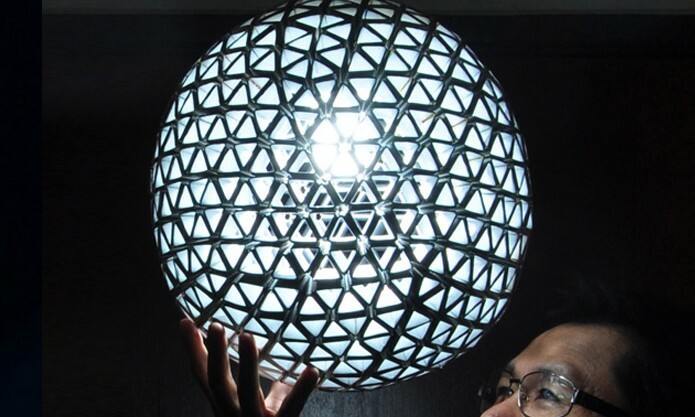 The TetraBox Spherical Lamp required approximately 450 empty soft drink packets and is 260mm in diameter.